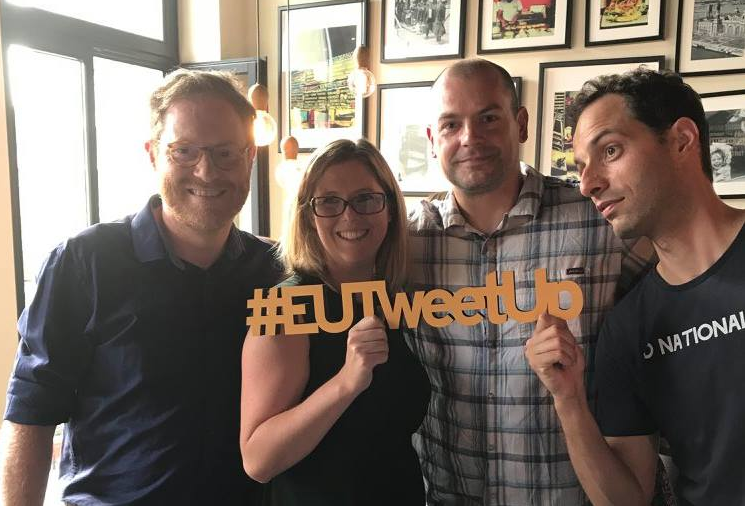 It started back in 2012 when Anne Laumen, Captain Europe and I decided to meet for a beer and invited other Twitter nerds along – #EUTweetUp was born. Now almost five years the ad hoc series of pub nights is still going strong. Anne has left Brussels and Captain Europe has retired, but Katie Owens and others have taken up the task of organising the nights. There’s even a dedicated website and Twitter account about the events as well these days. The idea remains the same – if people can get along on Twitter to debate EU politics, surely they ought to be able to get along over a beer? The answer to that is, by now, a decisive YES. On 13th July the EU Tweetup (pictured) was a bit special – high school politics teacher from Madison, WI, USA, Jason Knoll (second from right) was in Brussels with 8 of his students. He’d coordinated most of the trip through Twitter, and we all met him and chatted to his students.